This blog is part of a new series on Institutional Investor entitled Global Market Thought Leaders, a platform that provides analysis, commentary, and insight into the global markets and economy from the researchers and risk takers at premier financial institutions. Our first contributor in this new section of Institutionalinvestor.com is AllianceBernstein, who will be providing analysis and insight into equities. In the debacle of 2008—and again in much of 2011—diversification seemed to fail. Owning a well-balanced array of investments across geographies, sectors, investment styles—even asset classes—didn’t provide the expected protection from deep market losses. So investors crowded into cash and shorter-term US Treasuries in late 2008, and again this year, with gold also gaining renewed luster. Other investors stayed in higher-risk assets, such as equities, but bought insurance, in the form of puts, swaps and other derivatives, at prohibitively high prices. But diversification didn’t really fail three years ago, and it isn’t failing today. What failed is traditional diversification based on the traditional risk model, which assumes that volatility and correlations among assets and investment strategies will follow historical norms—and ignores the possibility of extreme economic and market environments. In extreme economic and market environments, panic drives investor flight from risky or illiquid securities or strategies whose expected payoff is far out in the future, and toward investments likely to pay off—or at least stay flat—in the near term. The most obvious example is cash. Less obvious are high-frequency trading strategies, which also delivered superior returns in the most recent market panics, and merger arbitrage. That is, in times of extreme stress, diversification among longer-horizon and higher-risk investment fails, but diversification across time horizons can be very effective. Intermediate-horizon investments include growth stocks, stocks of companies with safe and rising dividend payouts, and bonds with relatively high-interest payouts, including long-term and high-yield bonds. Longer-term investments include deep-value and distressed investments in any asset class, including equities and real estate. These tend to be most sensitive to macroeconomic conditions. 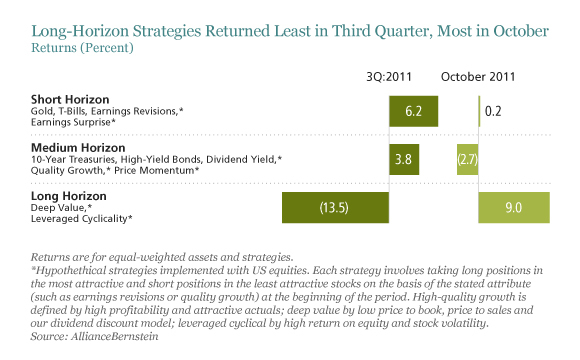 Investors shunned long-term investments for most of the third quarter of 2011, but were snapping them up in October (Display). As we’re all reminded repeatedly, the markets can turn on a dime. That’s particularly true in highly uncertain macroeconomic settings, when shifts from panic to exuberance (or vice versa) can lead to stampedes into crowded trades, as I have written previously. In such settings, it’s more important than ever to maintain exposure to well-chosen investments and strategies with short, intermediate- and longtime horizons. Each group will be poised to outperform in different market conditions and in response to different investor sentiment. The views expressed herein do not constitute research, investment advice or trade recommendations and do not necessarily represent the views of all AllianceBernstein portfolio-management teams. Vadim Zlotnikov is Chief Investment Strategist at AllianceBernstein.